Pradeep Gomantak Bhojanalaya at Fort is one of the only Malvani cuisine restaurants in the area that serves some lip-smacking seafood. A must-try if you’re working in and around Fort, and if you love seafood so much, this might be worth a lovely Sunday afternoon drive. 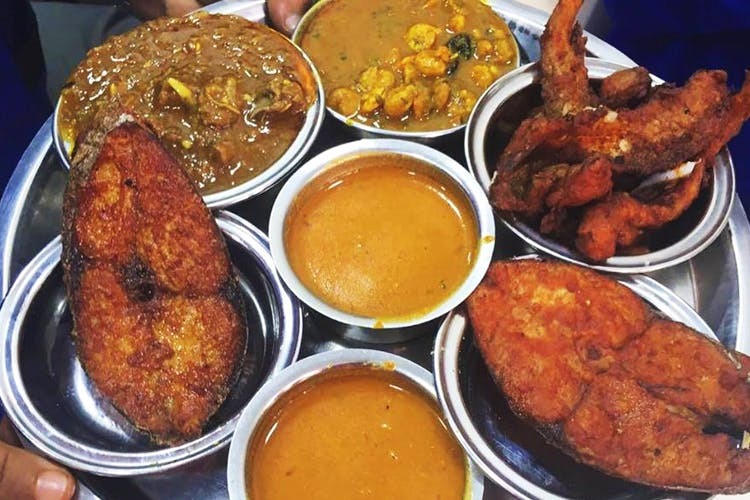 Run by Manisha, the owner’s daughter, Pradeep Gomantak serves delectable non-vegetarian thalis which consist of dishes that are usually found in the Hindu homes of Goa. It is a tiny, well-lit eatery which sees a serpentine queue of people lining up to grab a quick meal. One might not be able to procure individual tables here, and would have to share their tables with others. The chicken thali, chicken/mutton liver thali, the surmai thali or the infamous bombil thali are a must try. The sol-kadi here is delicious too. The only option for vegetarians is something called ‘rice plate’ which comes with dry potatoes subzi, dal and rice. This place is perfect for a non-vegetarian, especially a seafood lover, who wishes to grab a quick bite of splendid food within INR 200.